All square after Day 1 in Asheville. The first day of the U.S.-Australia Fed Cup by BNP Paribas tie went according to plan inside U.S. Cellular Arena in Asheville, North Carolina, on Saturday. Each of the team’s top players – No. 17 Madison Keys of the United States and No. 13 Ashleigh Barty of Australia – both secured straight-set wins during their respective rubbers that left the first-round tie even at 1-all. In Sunday afternoon’s first reverse singles rubber, Keys and Barty will square off in a pivotal match that could play a determining factor in deciding not only the tie’s outcome but also advancement to the semifinal round. 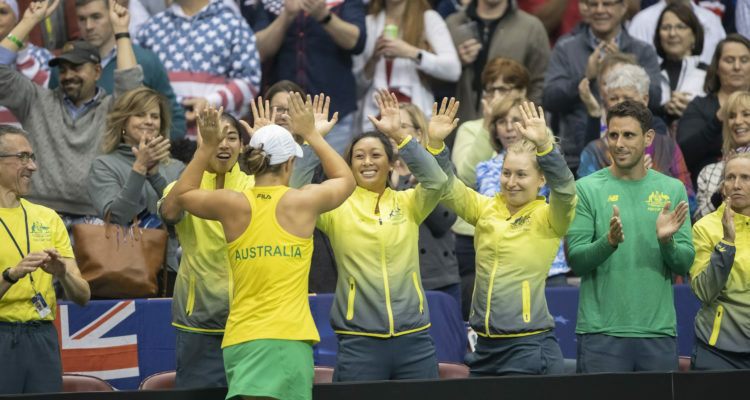 Australia is seeking its first Fed Cup title since 1974 while the 18-time Fed Cup champion United States is seeking its second title in three years after losing to the Czech Republic in last year’s championship final. In the opening rubber on Saturday, Barty, who reached the quarterfinals of last month’s Australian Open, controlled much of the pace and tempo of her 79-minute match against young American Sofia Kenin, ranked 37th, which she won 6-1, 7-6 (2). Perhaps, Barty, 22, can be forgiven for showing some nerves. Serving for the match in the 10th game of the second set, on her first match point, she hit a forehand long. Then, the 20-year-old Kenin hit an inside-out crosscourt forehand winner to spoil Barty’s second match point. Kenin went on to break Barty’s serve on her fourth break point in the rubber when the Aussie double-faulted to even the set at 5-all. However, down 5-6, Barty served three consecutive aces to even the set and and she cruised during the tie-break and won on her next match point, ahead 6-2, when Kenin netted a forehand on the 130th point of the rubber. Barty fired 10 aces and won 91 percent of her first-serve points. While her serving and defense lifted her in the first set, it was her experience and resolve that were her keys to victory when the match was on the line in the second set. Barty won the final five points of the tie-break and rubber. Australia’s 1-0 lead was short-lived, however, as Keys powered her way to a relatively easy 6-2, 6-2 victory over the 157th-ranked Kimberly Birrell in just 63 minutes. The win evened the tie at 1-all. Keys jumped out to early leads in both sets – 4-1 in the first and 5-1 in the second – and put away the match against the 20-year-old Australian on her first match point opportunity, in which she hit a lovely backhand service return for her 16th winner of the rubber. After losing, Birrell reflected on her missed opportunity to give the Aussies a 2-0 lead. “The weight behind (Keys’) shot was definitely different to anything I’ve really felt before. I think there’s a big difference between Top 100 players, Top 50 players, then the next tier up … You just get very few opportunities,” she said. Come Sunday, unless there are any last-minute substitutions, Birrell will get another opportunity when she faces Kenin in the second reverse singles rubber. Rubber 3 – Madison Keys, U.S., vs. Ashleigh Barty, Australia. Rubber 4 – Sofia Kenin, U.S., vs. Kimberly Birrell, Australia. Rubber 5 – Danielle Collins/Nicole Melichar, U.S., vs. Barty/Daria Gavrilova, Australia. Play begins at 1 p.m. Eastern Standard Time (6 p.m. GMT/London, 7 p.m. Central European, 5 a.m. AEDT Monday). The United States-Australia tie is being broadcast on Tennis Channel in the U.S. and 9Gem in Australia. This entry was posted in Fed Cup and tagged Ashleigh Barty, Australia, Fed Cup, Madison Keys, United States.